Almost every small business person considers whether or not to incorporate his business at some point. There are a number of advantages to incorporation, but there are also some disadvantages, as we will explore in this article. Note that the form of business ownership isn't fixed forever; you can change the legal structure of your business as it grows. A common scenario is for small businesses to start out as sole proprietorships or partnerships and become incorporated at some later date when the business has grown. If you are in Canada, take a look at How to Incorporate Your Business in Canada for information on the process. But is incorporation a wise move for your small business? The main advantage to incorporating is the limited liability of the incorporated company. Unlike the sole proprietorship, where the business owner assumes all the liability of the company when a business becomes incorporated, an individual shareholder's liability is limited to the amount he or she has invested in the company. If you're a sole proprietor, your personal assets, such as your house and car can be seized to pay the debts of your business; as a shareholder in a corporation, you can't be held responsible for the debts of the corporation unless you've given a personal guarantee. On the other hand, a corporation has the same rights as an individual; a corporation can own property, carry on business, incur liabilities and sue or be sued. Another advantage of incorporating is continuance. Unlike a sole proprietorship, a corporation has an unlimited lifespan; the corporation will continue to exist even if the shareholders die or leave the business, or if the ownership of the business changes. Selling a corporation is more straightforward than attempting to sell a sole proprietorship. If you incorporate your small business, you can determine when and how you receive income from the business, a real tax advantage. Instead of taking a salary from the business when the business receives income, being incorporated allows you to take your income at a time when you'll pay less in tax. You can also receive income from an incorporated business in the form of dividends rather than salary, which will lower your tax bill. Becoming incorporated gives you tax deferral potential if you are a higher income earner. Business tax rates are much lower than personal tax rates, so if your individual marginal tax rate is high and you don't need the funds for personal use, you can elect to leave money in the business and take it out at a later date when your personal tax rate is lower. If you took out the entire $300,000 as salary (and had no deductions), you would pay $91,500 in personal taxes, with a marginal tax rate of 33 percent. If you took out $200,000 as salary, you would pay $56,000 in personal taxes, with a marginal tax rate of 28 percent. On the $100,000 left in the company, the corporate tax would be 15 percent of the first $50,000 + 25 percent of the next $25,000 + 34 percent of the remaining $25,000, for a total of $22,250. Your total tax in this scenario would be $56,000 in personal tax + $22,250 in corporate tax = $78,250, a savings of $13,250 in taxes vs taking out the entire $300,000 as salary. Another tax advantage of incorporating is income splitting. Corporations pay dividends to their shareholders from the company's earnings. A shareholder does not have to be actively involved in the corporation's business activities to receive dividends. Your spouse and/or your children could be shareholders in your corporation, giving you the opportunity to redistribute income from family members in higher tax brackets to family members with lower incomes that are taxed at a lower rate. If you incorporate your business, it may qualify for the federal small business deduction (SBD). The SBD is calculated at the rate of 10.5 percent on the first $500,000 of taxable income, which may reduce your net corporate business tax to a much lower tax rate than that applied to your personal income. When you incorporate your business in a state or province, the business name you choose is reserved for your use in that state or province, or if you incorporate your business federally, you have the right to use your business name throughout the country. Sole proprietorships and partnerships have absolutely no business name protection. If your business is not incorporated, anyone can start a business with the same or a similar name if they wish. Incorporating your small business sounds like a great idea, doesn't it? But there are also disadvantages that you need to consider. 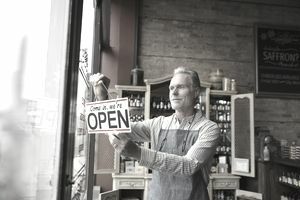 When you incorporate your small business, you'll have to file two tax returns each year, one for your personal income and one for the corporation. This, of course, will mean increased accounting fees. Unlike a sole proprietorship or partnership, corporate losses can't be deducted from the personal income of the owner. There is a lot more paperwork involved in maintaining a corporation than a sole proprietorship or partnership. Corporations, for example, must maintain a minute book containing the corporate bylaws and minutes from corporate meetings. Other corporate documents that must be kept up to date at all times include the register of directors, the share register, and the transfer register. Another disadvantage of incorporating is that being incorporated may actually be a tax disadvantage for your business. Corporations are not eligible for personal tax credits. Every dollar a corporation earned is taxed. As a sole proprietor, you may be able to claim tax credits a corporation could not. A corporation doesn't have the same flexibility in handling business losses as a sole proprietorship or a partnership. As a sole proprietor, if your business experiences operating losses, you could use the loss to reduce other types of personal income in the year the losses occur. In a corporation, however, these losses can only be carried forward or back to reduce the corporation's income from other years. The prime advantage of incorporating, limited liability, may be undercut by personal guarantees and/or credit agreements. The corporation's much vaunted limited liability is irrelevant if no one will give the corporation credit. When a corporation has what lending institutions consider to be insufficient assets to secure debt financing, they often insist on personal guarantees from the business owner(s). So although technically the corporation has limited liability, the owner still ends up being personally liable if the corporation can't meet its repayment obligations. A further disadvantage of incorporating is that corporations are more expensive to set up. A corporation is a more complex legal structure than a sole proprietorship or partnership, so it's logical that creating one would be more complicated and costly. Fees for incorporating a small business in a state/province or federally range in the hundreds of dollars, in addition to the previously mentioned maintenance and related fees, such as increased accounting costs. Closing a corporation (U.S. or Canada) requires passing a resolution to dissolve the corporation, winding up payroll accounts, and sending a copy of the Certificate of Dissolution to your state authorities (or the Canada Revenue Agency). You will also need to file your final tax returns for the corporation. ​You should definitely discuss your personal situation with your accountant and lawyer before you decide. He or she will be able to give you a much more exact picture of how incorporation could benefit your business, and help you see whether or not the trouble and expense of incorporation will be worth it to you. What Is the Business Limit for the Small Business Tax Deduction?